The New Hampshire Bill of Sale Forms legal documents that will assist in the protection of both a seller and buyer as well, will provide information that is needed for some registration processes. 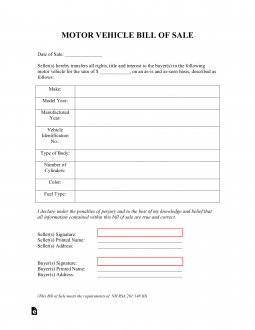 The forms will provide information with regard to the seller, buyer and whatever vehicles, vessels, firearms and/or personal item(s) that may require registration in the state of New Hampshire. Some forms will require notarization. You must provide the proper vessel/boat registration fees. See RSA 270-E:5 Vessel Registration Fees AND RSA 72-A:3 Boat Fees so that you will have the ability to properly calculate your vessel/boat fees. New Hampshire charges state fees as well as city fees. The state fees are based upon the weight of your vehicle. When preparing to pay fees be advised that you must provide a separate check, money order, and/or credit card transaction for each respective fee. 0 to 3000 lbs. : $31.20. 3001 t0 5000 lbs. : $43.20. 5001 to 8000 lbs. : $55.20. 8001 to 73,280 lbs. : $.96 per 100 lbs. Passenger vehicles and trucks: $3. Heavy vehicles and buses: $5. Motorcycles, recreational/farm vehicles, and trailers: $2. Initial license plate fee: one time fee of $8. Temporary 20 days registration: $10.